Allergic Reaction, Anaphylaxis in patients who remain hypotensive after fluid bolus: 0.1 mg, 1:10,000, slow IV, every 3 minutes, up to 0.5 mg.
0.01 mg/kg of 1:10,000 IV; repeat every 3-5 min. 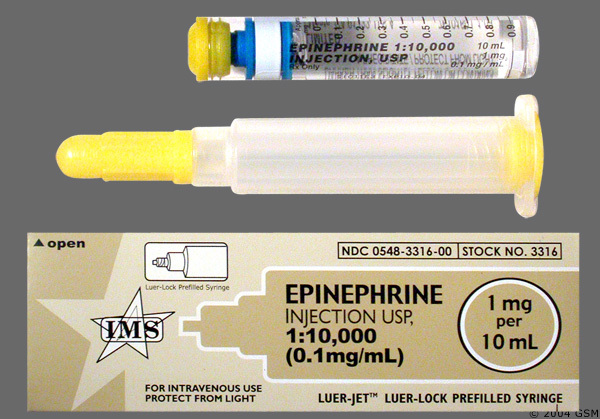 If < 15 kg, EpiPen Jr or Epi (1:1,000) 0.01 mg/kg IM (max 0.15 mg). May repeat Epi (1:1,000) 0.01 mg/kg IM (max 0.5 mg) after 5 minutes. Directly stimulates alpha and beta adrenergic receptors in dose-related fashion; causes bronchodilation, vasoconstriction, and increased cardiac output. Syncope has occurred following epinephrine administration to asthmatic children.